Elgin is a highly concentrated series of streets with none of them running in a straight line for very long. The city is surrounded by forest preserves on the east, north and west and undeveloped land on the south (although South Elgin is a city of some 45,000 people). 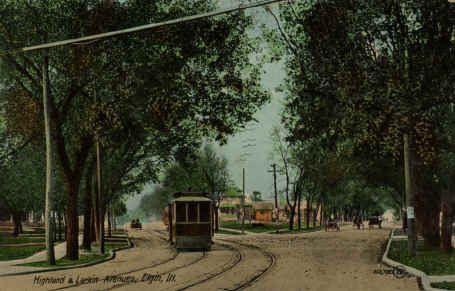 While the streetcars are long gone, this corner is still there. On the land that makes up the split are two gray houses that are mirror-identical versions of one another. To see what Highland Ave. looks like today, Press Here. This area must have been a favorite for postcard photographers. In addition to this image, I recently came across another view of this same corner, but with snow on the ground. To see that view, Press Here. Collecting postcards is slightly like having children - none of them are your favorite, but this card holds a special place in my heart. It reminds me of the 2001-2002 school year. Every day, I would travel from Gifford Street High School, on the east side of the river, to Larkin High School, on the west side of the river, to teach at The Visual and Performing Arts Academy. Just like none of your kids are your favorites, none of your students are your favorite either, but those goofy, spunky, creative, wonderful Academy kids will always have a place in my heart! To see an Arial View of the intersection of Highland and Villa, Press Here.